The journey of a thousand beads begins with a single stitch. 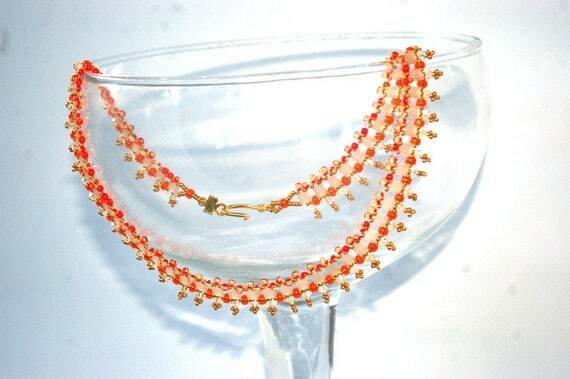 This is the original piece, done with silky gold Twins, Czech glass pearls, and metallic seafoam seed beads. For the tutorial, I worked up a second version using bottle-green matte Twins, cream druks, and metallic gold Duracoat seed beads. The big honkin' clasp on the green version came from my friend Amy at Bead & Glass Boutique - I bought a package of these clasps when I was visiting her shop back in August, and it was the perfect finishing touch for this necklace. Now, when I was writing this 18+ page tutorial, I realized that I needed someone to test it out for me. 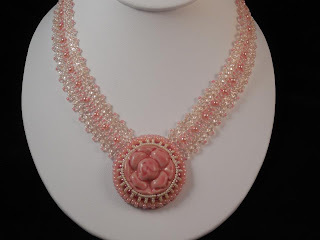 My wonderful friend Kristen Stevens volunteered, since she was one of the other winners of the Beads For Blog Post promotion, and late last night, she sent me two pictures of what she had done with my tutorial! Isn't it amazing? 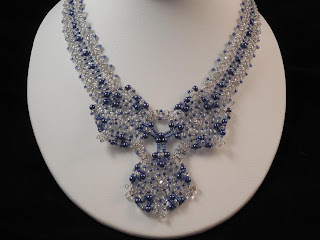 She used transparent Twins with some lovely metallic blue pearls - it looks like a necklace meant for a princess! Again, she rocked it. Pretty pink pearls, transparent Twins, and that awesome ceramic cabochon make a bold, yet totally feminine necklace. 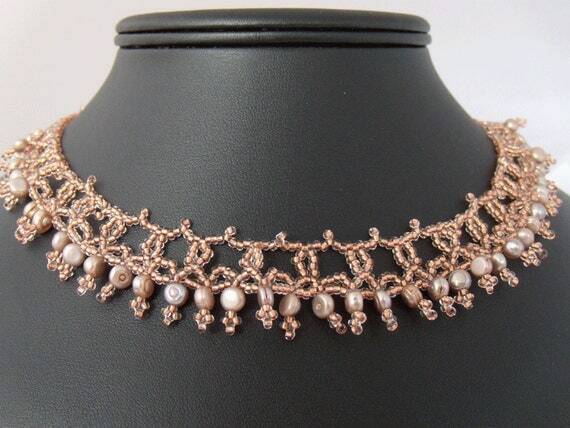 Kristen even blogged about her work with my tutorial on the Art Jewelry Elements blog! Earlier in the weekend, Dee "Beadee" Wingrove-Smith purchased the Helena tutorial, and emailed me this picture of her color choices. I have to say, these picasso Twins were really quite dramatic in this pattern! I've got the Helena tutorial for sale on both my Etsy shop and my Craftsy pattern store. Purchases made from my VanBeads Etsy shop will be emailed during the 24 hours following purchase, but if you buy it from Craftsy, you can download it immediately! 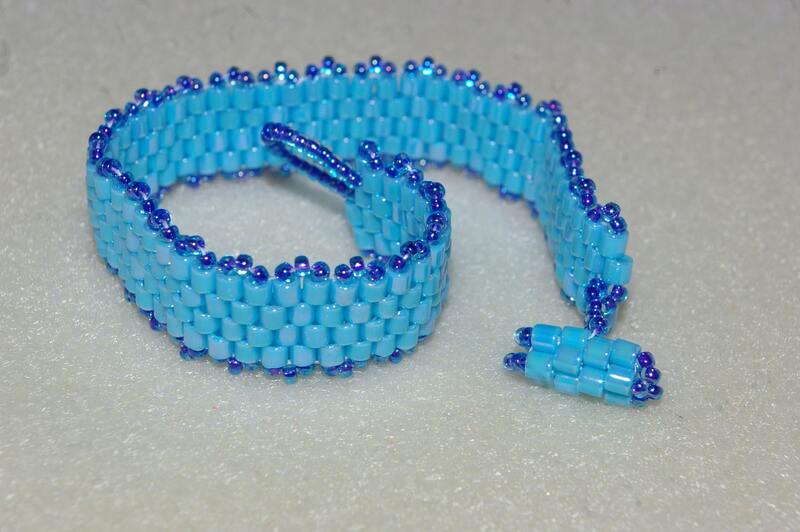 Helena is a great introduction to working with Twin beads, and it lets you stretch your flat, circular peyote stitch skills a bit without even knowing it! More later, but right now, I have a stack of writing staring me in the face that all needs to be done before 5 p.m. tomorrow... Off I go! Wow all of these are simply beautiful. Great job!!!! I love seeing all the wonderful art you create and then share in tutorials. Yours, Kristen's and Dee's pieces are all gorgeous. I am looking forward to making my own version of your design soon. Thank you for including my version. It was fab to make. your work is beautiful! 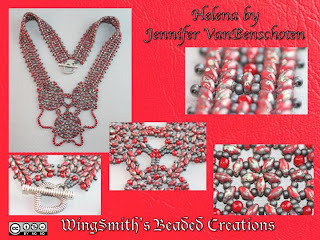 Stopping by visiting all the blogs taking part in the Bead Soup Blog Party cant wait to see what you make! I'm an almost-forty-something momma, devout yogi, fearless explorer of the world around me. Thrift shop maven, unflinching advocate of community supported agriculture and organic lifestyle, and mom to quite possibly the most adorable, loving little boy on this side of the planet. Take the pledge - BUY HANDMADE! See my work as part of Eva Maria Keiser's Artisan Colorway Series 2012! Items from My Etsy Shop!